As night settles in and the exterior of the Place des Arts in downtown Montreal, Quebec becomes illuminated, two people enjoy the tranquility of the trickling fountain. 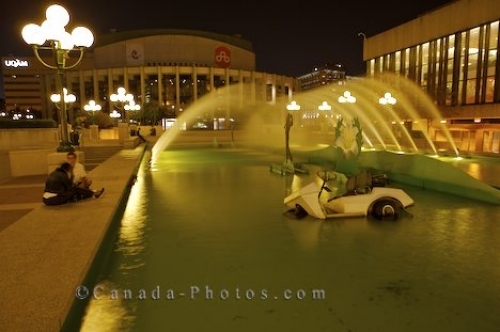 In the centre of the fountain, a crashed golf cart is displayed creating an artistic appearance before walking through the entrance of the Place des Arts. The Place des Arts began as a concert hall in the 1950's and due to its success, two new venues opened in 1967. By the 1990's, two more theatres were added along with many companies making Place des-Arts their home such as the Montreal Symphony Orchestra, Orchestre Metropolitain and many others. Picture of the golf cart in the fountain outside the Place des Arts in the City of Montreal in Quebec, Canada. Golf water feature outside Place des-Arts in downtown Montreal at night, Quebec, Canada.